A small pond in the garden of Paul Abels. When you envision a water feature, it may evoke the gentle sound of a soothing waterfall, or perhaps your thoughts go to the splashing of a brook over rocks. Maybe a lovely pond with koi and water lilies will give you a sense of peace. What you don’t picture, though, is the hard work it can take to keep your new joy clear and your expensive koi healthy. What can cause a water feature to become so high maintenance? And are there types of water features which aren’t so high maintenance but still give you the feeling of pleasure and serenity that you’re looking for? Why are some water features so high maintenance? There are several reasons water features can become high maintenance, and in most cases the bigger the water feature is, the more time it takes to maintain it. String algae: The only good thing that can be said about this algae is that it’s a bright lovely green; if you’re into the color green. This stuff webs together and will make a colony in a pond or waterfall. It loves warm water and will thrive and grow there, so if your pond gets any kind of sun exposure, you will have yourself some very happy algae. Overfeeding your fish increases the algae as well; algae thrives on nutrients and fish waste is full of them. To remove the algae, you can use an algae tool (I like the Pond Shark) or if you can reach it, just twirl it around in a clump, and it will come out easily. Murky water: Murky water can be caused by a few things. One of them is insufficient filtration; by not having the correct size of filtration system needed for your water feature, it can leave a lot of particles behind. Another thing that causes murky water is not keeping your water feature balanced. Your pond also needs rocks and gravel plus aquatic plants to give the bacteria and fish waste someplace to settle and be filtered out; even if the whole package of rocks and gravel and plants aren’t your thing, they do perform a function. Critters: Unwelcome visits from unwelcome critters. This can include raccoons and herons who would love to snack on your koi. Raccoons also like to upturn rocks and dig up your surrounding vegetation and plantings. You then end up spending the next day counting your missing fish and replanting your flowers. Leaky liners: This can be a real pain. The liner may not have been heavy enough to do the job or maybe parts of it weren’t sealed together correctly. Whatever the reason, you have to find out why it’s leaking and fix it before your fish are gasping for air. 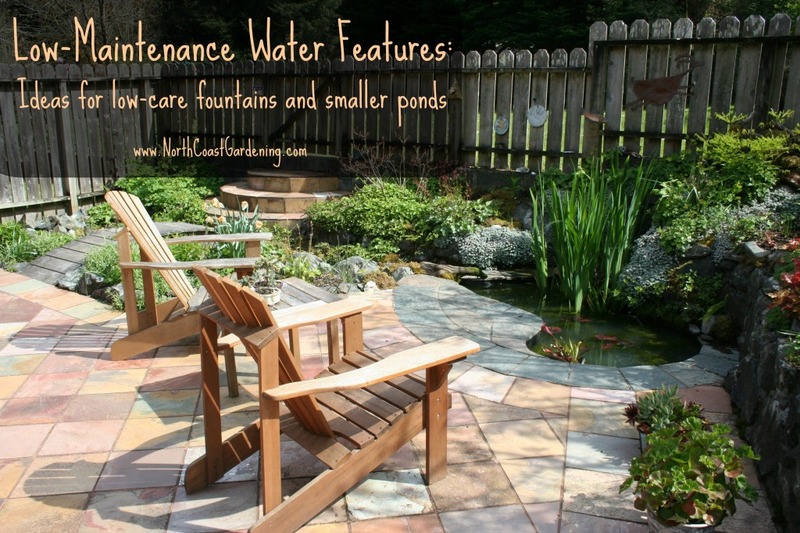 There are ways to enjoy the sound of water with fewer maintenance issues. A low maintenance water feature is usually smaller and more compact, and fountains fill the bill. Fountains are easier to clean than a pond, since they’re easier to reach on all sides for maintenance. Fountains can be put in a spot where falling leaves won’t clog them, and the rapidly moving water helps prevent some kinds of algae. Plus, if you’re interested in attracting wildlife to your water feature, fountains are great because birds can drink with less danger from neighborhood cats. Prefabricated fountains: They come in all sizes and shapes, and the nice thing about them is that they can go against walls and fences. A water fountain can be used as a garden accent, or can sit on your patio. Bigger isn’t always better; a small fountain can be just as enjoyable as a large one in attracting hummingbirds and creating a lovely sound. Self-contained bubbling containers: These are basically a homemade fountain, and are another easy choice (HGTV has a tutorial here). You can make this water feature out of a pot or container of any size, and they are very attractive given how simple they are to make. Or you can buy three containers of various heights and make a cluster for the water to run over to produce a light trickling or splashing sound. Miniature pond: You can make your pond out of large tubs or containers or buy a small pre-made one. It will need about 4 to 6 hours of sunlight to keep the fish happy and the pond clear. Make sure the location you choose doesn’t have run off rain water. This could disrupt the balance of your pond. If you choose to aerate your small pond, it will help keep bugs out of it. A water basin feature: These work by catching dripping water or water that is pouring from a nearby spout. When the basin is full, it overflows over rocks that hide a reservoir that is buried under the ground. The water is recirculated back into the spout and the process starts over again. Your basin can be made from copper, aluminum, wood or stone; and the spout can be made from bamboo or metal. Pondless waterfalls: A great option for people who don’t have the space for a pond or don’t want the maintenance involved. Water cascades down rocks or a stone wall and onto a bed of ornamental gravel. The gravel is over a retaining basin that catches all the water. A pump then sends the water back up an over the waterfall. The sound of the waterfall is there without all the upkeep. 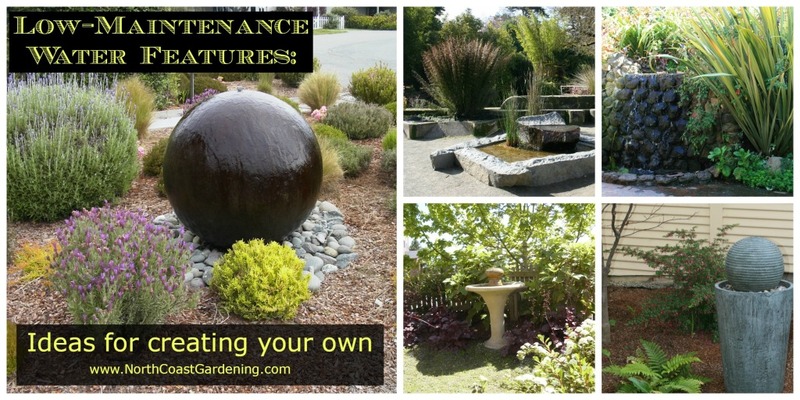 You don’t have to spend hours on maintaining a water feature; as you can see, there are many options available that can give you the peace and serenity you are seeking with very little work. So sit back, put up your feet and relax to the musical sound of water. All photography by Genevieve Schmidt. Well done article -makes me want to put something water related in my yard ! Nice. I totally agree. It’s a good combination garden with water feature. In my yard also has a small lake for my family. did you make the concrete (looks like concrete!) sphere water feature? I am wanting a sphere bubbler and am planning on making one. Thought you might have tips. ???? Thanks for the tips! I’ve always wanted a water feature in my yard, but the only thing that’s been keeping me from getting one is that they seems like they would require a lot of maintenance. I’m glad that there are water features that are in fact much easier to maintain. I’ve always liked the idea of having a miniature pond or a pondless waterfall, so I might like to include either one of those two as part of my landscaping project. Thank you for talking about how the bigger the water fountain it, the more time it takes to properly maintain it. I can see that taking the time to assess your needs carefully can help you find the best type of fountain to help your property look great and help you relax. Personally, I would want to make sure I do some research and learn about how to properly maintain and clean the type of fountain I want before I buy it so it lasts longer and increases the value of my home. Algae might not be pretty, but it’s profitable. It has tons of nutrients and has been hugely popular in Asian for centuries. It’s starting to gain ground in the west, meaning it’s a good business to get into. A friend of mine grows it indoors under plant grow lights (he’s using an LED light called Veg 8 specifically) and says he’s making way more money than he did with his previous (not so legal) crops.